As publisher and chief photographer I have been covering major tennis tournaments since the late 1960’s, 50 years in all, covering well over 100 Grand Slams in Melbourne, Paris, Wimbledon and New York. The end of the Laver and Rosewall era made way for the John McEnroe, Bjorn Borg and Jimmy Connors years followed by the precocious talents of an 18-year-old Boris Becker bursting onto the scene and winning Wimbledon in 1985. 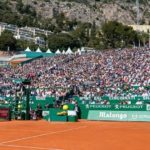 Then there was Pete Sampras, Andre Agassi, Roger Federer, Rafa Nadal and Novac Djokovic all displaying their finely honed talents and raising the bar for all those who follow to clear. My favourite final of all was the unforgettable “late, late show” at Wimbledon 2008 when Rafa Nadal won his first Wimbledon title by beating Roger Federer 6-4, 6-4, 6-7 (3-7), 6-7 (8-10), 9-7 in a match lasting 4 hours, 47 minutes, a victory which must surely rank as one of the most dramatic and compelling finals of all time. Longing for the revival of British Men’s Tennis, which had virtually become extinct in 1936 with Fred Perry’s final Wimbledon Mens Singles title, Greg Rusedski and Tim Henman slowly kindled the flame and ultimately the breakthrough came with Andy Murray winning the US Open in 2012 and finally becoming a Wimbledon champion a year later at the spiritual home of Tennis. And of course there were the Ladies. Margaret Court, Evonne Goolagong and Billy Jean King, made way for Chris Evert, and a rare British success for Virginia Wade, was followed by legends Martina Navratilova and Steffi Graf. The eminently photogenic Martina Hingis, Anna Kournikova and more recently Maria Sharapova and Caroline Wozniacki were always a joy to photograph, as is the powerhouse that is Serena Williams. For the last fifteen years I have been accompanied on tour by my photographer wife Anne, and we will bring you the best of Grand Slam Tennis pictures from on and off the court.